This RIHL will provide mortgages at reduced interest rates to first-time buyers who have been refused a mortgage or were offered “insufficient” finance, by at least two lenders. (not credit unions) . As we reported at the launch of this scheme – there was only €200 million of funding made available – so, even based on an average loan of €250k – that would mean there would only be enough funding for around 800 mortgages. In march 2019 – goverment figures show that 575 people had been given a Rebuilding Ireland home loan and a further 1,000 applicants had been approved but had not yet drawn down the funding. All the fundng of €200 million has been allocated. There is a chance that loans will still be given because the loan offers expire after six months if they are not drawn down – so more finance might become available. The government are now waiting for approval from the Central Bank if it is OK to carry on with these loans and increase the funding. The Rebuilding Ireland Home Loan (RIHL) is targeted at people who have access to an adequate deposit and have the income capacity to repay a mortgage, but who are unable to access a mortgage big enough for them to purchase their first home. Borrowers will be able to borrow more than they would from the banks – it seems the Central Bank’s 3.5 times income rule doesn’t apply for this loan. For example – with single applicants – mortgages of up to 5 times earnings seem to be possible under the RIHL scheme. For comparison with the mainstream lenders – see our tables of the Best Mortgage Rates here. You can use the loan for new and second-hand properties, or to build a home. It is possible to borrow up to 90% of the market value of the property – so you will need a minimum 10% deposit. €320,000 in counties Cork, Dublin, Galway, Kildare, Louth, Meath and Wicklow. So – because of the minimum 10% deposit requirement – In Dublin, Kildare, Louth, Meath, Wicklow, Cork and Galway the maximum loan amount is €288,000. For the rest of the country the maximum loan amount is €225,000. Have been in continuous employment for a minimum of two years, as a primary applicant or be in continuous employment for a minimum of one year, as a secondary applicant. Have an annual gross income of not more than €50,000 as a single applicant or not more than €75,000 combined as joint applicants. Provide evidence of insufficient offers of finance from two banks or building societies. It is also a requirement that a specific Local Authority mortgage protection insurance (MPI) is taken out in respect of these affordable loans. It seems that the price of this insurance is more expensive than others that are available – but apparently the local authority MPI scheme covers disability as well as death. The the disability cover is for the full period of the disability and not just 12 months as is the case in the majority of MPI policies available. The charge for this Local Authority MPI is curently just under 0.5% of the outstanding mortgage – so on a €200k mortgage – this would cost about €83 a month. (Reducing each year). Applications for the Rebuilding Ireland Home Loans can be made to local authorities . You can get a form online here or from your local council offices. Important note – : You need to apply to the local authority in the area you want to buy the house, regardless of where you currently live. As at the end of September, there had been almost 3,000 applications but just 1,134 of these were recommended for approval by the Housing Agency. A single applicant earning €40,000 a year could borrow €201,000 – to buy a house worth €221,000 with a deposit of €20,000 – which would mean repayments of €852 a month for 25 years (fixed at 2% per year) (Plus mortgage protection of about €83 a month). Total €935 a month. 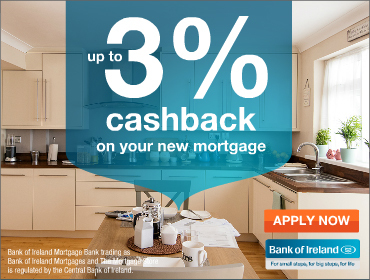 Joint applicants earning €58000 could borrow €288,000 under the Rebuilding Ireland mortgage – which would mean repayments of €1221 a month fixed for 25 years. (Plus mortgage protection of about €120 a month – total of €1341 a month). They could buy a house worth 320,000 with a deposit required of €32,000. A bank would only lend about €203,000 in this situation. Further information is available from the Rebuilding Ireland help desk at 051 349720 (8am to 5pm – Monday to Friday) or from your local authority.